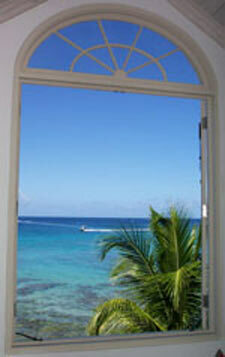 The most under emphasized reason why Barbados villas are very special is the full time staff. Each home comes with a minimum of a cook and a maid. Many houses like "Fustic House" and "Nelson Gay" have a butler, cook, several maids, a laundress and a crew of gardeners. The staff arrives early in the morning and departs every evening after dinner is served. Never are they obtrusive; always they are gracious and eager to please. Staff members have been with many of these wonderful houses forever. Each day that you choose to dine in your villa, simply make your arrangements with your cook. If you choose to dine out, that's okay too. Did I mention that laundry is done daily? Thank you Daphne for the extra starch in my shirts. I really did bring too many clothes! Severine had returned from her exploration of the Grenadines. That evening we had dinner at Ragamuffins...what a delightfully funky place! Ragamuffins is housed in a former Chattel house and specializes in curries, jerks and fresh fish prepared in variety of ways - generally highly seasoned - which is okay with me. Early Saturday morning all of us took a tour of the newly renovated Sandy Lane Hotel. Sandy Lane is arguably the finest full service resort in the Caribbean. Their full service spa has a menu of services that resembles a first growth Bordeaux wine list. Guest rooms all have large plasma screen TV's with high speed Internet access, bathrooms are the kind you dream about, and every chaise lounge on the beach has a yellow flag you stick in the sand if you require a "beach butler". Lunch that day was at the Fish Pot in St. Peter, just north of Speightstown. This was my favorite restaurant of the visit. I had the chilled pea soup with dill, and the seafood salad of grilled lobster, scallops and shrimp with three ailoi's. The Domain Ott Rosé was the perfect wine to a perfect Saturday afternoon lunch. Although there is much to see and do on Barbados, do not forget to stop and smell the roses. Stop the car and watch a cricket match or a soccer game. Not only is it an occasion to watch everyone enjoying themselves, it makes for a terrific photo opportunity. After lunch, we drove the 45-minutes to Barbados' wild coast to watch the Independence Pro Surfing Competition at the "Soup Bowl". The following morning we threw caution to the rain and drove to Crane Beach early in the morning to see the pink sand and take a swim where the Atlantic meets the Caribbean Sea. If boogie boarding or body surfing is your thing, then Crane Beach is the place. Caution: There are some severe undercurrents, so do not swim alone. There is excellent shopping on the island, from local arts and crafts to many antique galleries. Don't forget to bring home at least a couple of bottles of the locally produced hot pepper sauce and Mt. Gay Rum, especially the "Old" - it's a real bargain. When touring the many villas several antique lithographs of golden pineapples caught my eye. I just had to have one. I've always enjoyed the meaning behind the pineapple. I first learned during my summers on Nantucket that pineapples were a symbol of hospitality. Sea captains upon returning from their far away journeys placed a pineapple on the gatepost of their home signifying the captain had returned and willing to receive guests. What I learned on Barbados was that the sea captains actually learned the practice from the Arawack Indians, the original inhabitants of Barbados. In my quest I never found the perfect pineapple print to bring home for my living room, but it's on my "to-do" list when I return. Our local hosts and strangers alike made us feel very welcome. It is no wonder that Bajans are very hospitable. Why shouldn't they be? They live on an island surrounded by a warm turquoise colored sea, they lead prosperous and fruitful lives and they have their priorities set correctly. One morning while reading, An Outline of Barbados History by P. F. Campbell, I read: "Thirty years ago Barbados was little known to the world at large. Today, with so many thousands visiting her shores every year, this is less true. Nevertheless, her present fame rests not on her history, nor on her beaches and climate. It rests on her cricketers. The Barbadians are quite content that this should be so."